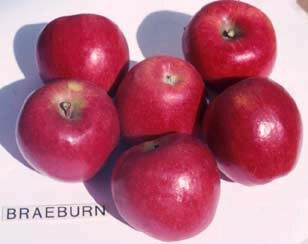 Bud sport of Braeburn, 1981, Mr and Mrs John Hill, Hastings, New Zealand. Moderate vigour but can be stunted and dwarfed if overcropped or on poor soils. Susceptible to scab and mildew. Early–mid season, spur flowers tend to be much earlier. Tall conical in shape, closed eye in small basin, medium stalk in narrow basin. Bright orange-red with stripes, attractive, lenticels quite prominent, susceptible to sunburn. Creamy, firm, crisp, juicy, flavour with a tang; does not brown quickly when cut. About 17 days after Delicious. Medium yield. Can be biennial. Excellent but can be susceptible to bitter pit.